My teacher told me not to look at the tablature, just to copy him; however, there is flexibility on this (in fact I always consulted the tablature at home). Whereas most teachers today teach using the nylon-wrapped metal strings invented during the Cultural Revolution, my aim is to appreciate qin music the way it was experienced in the past, with the silk string aesthetic. Others generally teach melodies as learned from their teachers - melodies in the modern repertoire; these are mostly the same melodies I learned from my teacher, but I usually begin by teaching the Ming versions of the same melodies. For players who have mastered the basics there is also the possibility of experimenting with new music. 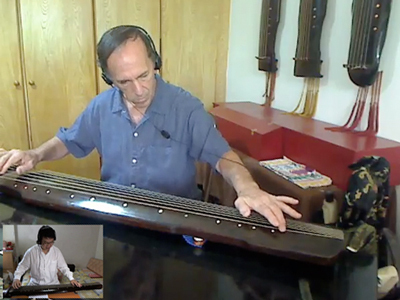 The discussion here is prefaced with some background information on the guqin. I try to supplement the purely musical aspects of guqin study by helping students become more familiar with its rôle in Chinese culture. Most of the information is available on this website. "Reconstructing" guqin music (in Chinese, 打譜 dapu6) means learning music directly from qin tablature rather than from a teacher. Since 1976 I have reconstructed over 250 melodies written in qin tablature during the Ming dynasty (1368-1644 CE). I have published seven CDs that contain a portion of this music, along with staff notation of all the melodies; and this website has over 200 of the melodies available as MP3 files. Qin players who reconstruct early melodies often modify them in accordance with modern practice, or by selecting what they like from various early versions of the same title. There is nothing wrong with having such influences; they are, in fact, very difficult to avoid. As for the qins they use, although the exterior physical shape of qins seems unchanged for at least 1,500 years, since the Cultural Revolution most qin sound boxes and top surfaces have been designed for use with the metal strings commonly used today. It should be emphasized that this search for historical accuracy does not conflict with free expression: once definable ancient melodic styles have been identified, HIP can freely interpret within these styles. New melodies (xin diao 新調): new compositions, in both old and new styles. This includes melodies for guqin with other instruments. Conservatories require special mention with regard to guqin.8 The most loaded description above is "conservatory melodies", and the same might be said for such other related expressions, also often misused, as "conservatory trained" and "conservatory style". This whole issue, though separate from the teaching of historically informed performance, is very important and so is discussed in some detail in this footnote. The expression HIP is usually reserved for music that has survived only in written documents. But related to HIP of written qin music would be performances that closely follow recordings of recent qin masters. Today the new conservatory style is blurring the distinctions of the old qin schools. Both for historical and aesthetic reasons it is very important to document and preserve the distinctive styles of recent leading masters in these old schools. At present this is still possible through recordings as well as through the memories and playing techniques of their students, but a concerted effort must be made soon. All five categories defined above should be encouraged. Today the conservatory style seems to be in the ascendant. However, an increasing number of qin players (including beginners) are now interested in the HIP category. One day this will be recognized as a "school" (派 pai, also translatable as "group" or "system"). I would suggest that my personal style aims for this category, as it has developed through my exclusive play of melodies according to Ming dynasty sources. The qin was the instrument of China's literati. The literati liked to write things down, including the music of their most revered instrument. Thus qin music forms one of the few non-Western written music traditions. Unlike much Western music, however, qin music was not composed during the writing process. Melodies were generally learned from teachers by rote method. The written music described not the melody but, in considerable detail, the way a master played a piece. The literati transcribed this qin music using a shorthand tablature. The tablature groups elements of Chinese characters into clusters. These clusters detail tuning, finger positions, placement and stroke techniques, and ornamentation. The tablature also includes other instructions, but gives little direct information about note values (rhythms). The earliest surviving written qin melody has been reliably dated from about 650 CE. Entitled You Lan (Hidden Orchid) and preserved in Japan, it describes in over 200 lines of longhand tablature a melody of about 700 notes. Historical records suggest that scholars wrote down qin music before that time, and that during the Tang dynasty (618-905) they produced qin handbooks collecting melodies written in short-hand tablature. However, these were all hand-copied and none has survived. The only other qin melodies surviving in sources printed before the 15th century are a few short pieces in 13th century publications. The first surviving major handbook, Shen Qi Mi Pu (Handbook of Spiritual and Marvelous Mysteries, 1425 CE), is also the first known printed one. It has 49 titled melodies and 15 modal prefaces, all purportedly copied from earlier sources. This handbook was the original focus of my research. Since completing my Shen Qi Mi Pu recordings and transcriptions onto six CDs and three ring-bound volumes of transcriptions I have also been learning numerous melodies from 16th century handbooks. It is difficult to categorize by school much of the qin music played throughout history. The high reverence bestowed on qin meant that many people studied it as part of their general education. Most learned only a few melodies that they might continue to play throughout their lives, often with a musical skill not easily apparent to listeners. Many musically skilled players probably also developed very personal styles: successful literati often had to spend years away from their teachers. And in spite of the great efforts to write down the music, guqin music still remained in many ways an oral tradition. As for known qin schools, historical records provide varying amounts of detail. Schools seem to originate with a particular master; generations of students then modify the style and repertoire. Schools mentioned today are often associated with a specific region. However, by the mid-twentieth century these schools had already lost much of their individuality. Players from different regions study each other's melodies and styles. The introduction of metal strings during the Cultural Revolution, and their general acceptance since the 1970s, has led to stylistic developments which at present are not very well defined. However, the survival of more than 100 qin handbooks published between 1425 and 1937 makes it possible to form a new school based on scientific re-creation of music from this old tablature. If appropriate principles are followed, this should lead to a larger and more varied contemporary repertoire. This will be especially true if it can also lead to a fuller understanding of the differences that distinguished the various historical qin schools. Throughout history qin players, like Chinese painters, have often tried exactly to repeat existing or previous creations. They have also developed new versions of these as well as creating completely new compositions. 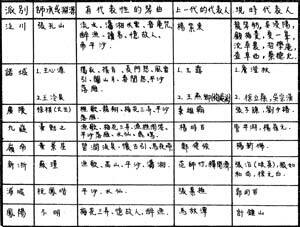 In 1957 Zha Fuxi published an index of 104 surviving qin handbooks dating from 1425 to 1946. It includes 659 melodies in thousands of versions. So far I have personally reconstructed over 200 of these. Since about the year 2000 there seems to be an increasing interest in China in reconstructing more of these old melodies. However, as yet I know of no other systematic efforts being made to do this in a manner that might be considered as historically informed performance. When learning old melodies I have tried strictly to follow specific old tablatures. This process has revealed some of the changes in style that took place over the years. The clearest changes are in modality; many early melodies are less pentatonic than are pieces played today. Some structural differences seem to be discernable as well. The information in qin tablature is rather different from the information provided in early Western music notation and tablature, but there is comparable detail. Even after over 100 years of effort it is impossible to determine the accuracy of Western historical music reconstruction. To date much less effort has been made towards presenting historically informed early qin performance. In both cases the reconstruction efforts have been useful from an historical perspective, but it is the beauty of the resulting music that makes continuing efforts most rewarding. The major objective of an Historically Informed Qin Performance School should be to recover and/or preserve the qin performance practice of various periods. My own focus is on music in handbooks surviving from the Ming dynasty. My teacher, Sun Yuqin, had me learn by copying his play exactly. It is my understanding that this was the traditional teaching method, and that only advanced students should play in a more creative manner the music they had learned by rote. The HIP school also follows this principle when learning melodies from old tablature. School members begin by using the traditional rote method to learn a number of short melodies already reconstructed in accordance with their Ming dynasty tablature. These pieces introduce qin playing techniques and early melodic styles. The historical and cultural associations of the melodies are discussed (the melodies were created by the same class of people who produced Chinese poetry, literature and fine art), and there is analysis of the principles of historically informed performance. This method enables people to learn without having to read or speak Chinese. The tablature system, although complex, is sufficiently limited in scope that the symbols can easily be deciphered by people who, because they can execute the movements from memory, already know what the symbols mean. Once a sufficient level of play has been mastered, freedom of interpretation is encouraged, as well as the creation of new pieces either within or beyond the early styles as presently understood. Advanced members may also attempt their own reconstructions. Until the 1970s qin melodies were played almost exclusively on qins with silk strings. Since silk strings require different playing techniques than do the metal strings in common use today, HIP requires playing early melodies exclusively on silk string qins. Efforts will be made to help students find qins appropriate for play with silk strings. For the first melody, which is rather like an exercise, several different versions are learned. All other pieces are learned according to their earliest surviving publication. Early versions of familiar melodies have significant differences from versions played today. Comparing them can give insights into early qin styles, so even students with previous qin experience should begin here. Although knowledge of written or spoken Chinese is not a requirement for learning, qin players should at least be able to pronounce correctly Romanized Chinese (pinyin). The first five melodies can be sung in Chinese; the notation provided includes the translated lyrics, pronunciation in pinyin (the Chinese Romanization system), and the original Chinese characters. The singing of melodies before playing them serves both as a memory aid for the melodies, and (where necessary) as a tool for learning the Romanization system. Although of uncertain age, this was the first piece I learned from Sun Yuqin so, after some preliminaries emphasizing the importance of plucking correctly with the right hand, without looking at it, I begin by teaching this piece. Ancestor of the above. Comparing various early versions in Ming dynasty handbooks shows change and continuity in the repertoire. All the versions are good exercises in the form of melodies, and several should be played until the basics are learned. "For those at the beginning level, if they skip this melody and search for something else, the more their skills increase, the more distant it is from their understanding"
This is learned according to the version in Taigu Yiyin (1511). The melody is closely related to the Xiangjiang Yuan (Xiang River Lament) played today. The lyrics printed in at least one edition of the modern version are almost the same as here, but it is rarely sung. As commonly played today this melody is little different from the original 1614 version I play and teach. No lyrics. The earliest surviving version, from 1634, is called 落雁平沙 Yan Luo Ping Sha; it is shorter and more straightforward (subtler?) than the modern version. This introduces non-standard tuning. Taught from Faming Qinpu (1530), it is again similar to the modern version but there are significant differences; e.g., it uses qiliang tuning (raised second and fifth strings) whereas the modern version uses ruibin (raised fifth string). The lyrics expand on a famous poem by Wang Wei. This song is played according to the version in Fengxuan Xuanpin (1539). Sima Xiangru (179-113 BCE) is said to have seduced Zhuo Wenjun by singing this. This melody, from Songxianguan Qinpu (1614), is learned rhythmically and then freely. This illustrates my understanding of the rhythmic structure of early qin music; no lyrics. These two related melodies, the former from Shen Qi Mi Pu (1425), the latter from Songxianguan Qinpu (1614), beautifully illustrate changes in the qin repertoire during the Ming dynasty. Other melodies can be substituted for the above, based on the students' interests (e.g., sharing familiar melodies with friends or having an interest in special themes), as well as on the teacher's current inspiration. Videos for learning guqin, still under development, begins with basic techniques. These videos are particularly important when teaching remotely (i.e., online). My equpment is Mac; my Skype address is Silkqin. From Celestial Airs of Antiquity, Introduction, p. 7. Related to this is the rising cost of buying a qin. The difference in construction between silk and metal stringed qin is discussed elsewhere. Often a qin designed specifically more metal strings has a very weak sound when played with silk strings. A lighter instrument, even a very inexpensive one, may be better for someone beginning on silk strings. As a curious aside: people who have played only on metal strings often comment on how rough and uncomfortable silk strings are; people who have played only on silk often comment on how hard and uncomfortable metal strings are. This emphasizes that the playing techniques for the two types of instruments are really quite different. The earlier versions of modern melodies often seem simpler at first glance. To my ears this makes them on the one hand more melodious, on the other hand more amenable to - or requiring of - subtle play. Although "Dapu" means learning music directly from tablature this is not the same as "sight reading" or even learning from standard notation. This is because of the information the tablature omits: the lack of direct information on note values means considerable work needs to be done in order to turn the finger positions and stroke techniques into actual music. Before playing the actual music the player must reconstruct the musical structures implied by the tablature. 7. Translating "Historically Informed Performance"
The translation 復古風格演奏 was suggested to me by 中央音樂學院教授余志剛 Prof. Yu Zhigang of the Central Conservatory in Beijing. He has also suggested as another possibility 古風表演 gufeng biaoyan". Before that I was using the expressions fugutan (復古彈, literally, "return-to-antiquity play"), and fugu biaoyan (復古表演 "return-to-antiquity performance"). This issue is discussed further in a footnote under Some Issues in Historically Informed Qin Performance. "Conservatory melodies" may simply refer to melodies played in a sort of standardized way that cannot be associated with particular players. Students who have learned these may or may not continue to play in that way after they leave the conservatory (just as they may change their playing style after they have left an individual teacher who taught in an individual style). However, the simple mention of conservatories naturally leads one into a very complex topic, the complexity beginning with whether "conservatory" refers to an ideal or to the reality behind the ideal. The ideal conservatory gives musicians tools that will help them do whatever they want with their chosen art. In the same way the ideal university should prepare its students to deal with all aspects of the real world (universe). Part of this is the skills and facts learned; perhaps more important are the attitudes developed. Many conservatories (some would add "especially in China", or "especially as a result of the Soviet influence on Chinese conservatories in the 1950s") are biased towards a 19th century Western aesthetic. Here the problem is not the conservatory system per se, it is the conservatory system as it then exists. As for the above statement that the ideal conservatory gives musicians tools that will help them do whatever they want with their chosen art, one might also debate the sort of moral framework the institute should provide in this regard. Here it is important to note that the stated qin tradition of playing for self-cultivation is rather at odds with the general conservatory aim, where melodies are taught in a way that their performance should please an audience. Perhaps one should argue that in China there should be divinity schools where traditional qin playing is taught; its graduates would then go out to propagate traditional styles and attitudes (beliefs). This would contrast with the music conservatories, where the aim must generally be to provide students with their greatest possible options for teaching and performing professionally. Here melodies are taught to please an audience rather than to follow the tradition of self-cultivation, and here there is an emphasis on showiness and technical skills (this may or may not be a criticism). The ideal in strict traditional master-apprentice training is that the student eventually becomes an extension of the master (or, at least, the master's art). The student may think of the master's teachings as a reflection of the way the art has been expressed over generations. Most likely, though, the art has gradually changed, and if the student wishes to go back to earlier sounds this may require the sort of independent thinking that usually does not come through the tradional training methods. It should, though, be part of conservatory training. In reality, although "traditional performance" and "conservatory-style performance" reflect constrasting approaches, neither approach necessarily trains one for "historically informed performance". Furthermore, this discussion of playing qin according to the traditional silk string aesthetic and the self-cultivation ethic, versus emphasizing performance skills, leaves aside the whole issue of what were really the predominant forces behind traditional qin play - for more on this see The qin in popular culture. Here it should also be emphasized that playing qin according to the aesthetic of playing for oneself and/or playing as a form of self-cultivation does not necessarily conflict with learning the playing skills taught in a conservatory. Conservatory training discourages the free interpretation that was an important aspect of traditional music genres: this is a function of the change from learning by oral tradition to learning from written scores. Since it is debatable how free qin music was in the past, and certainly how free it had become by the time it was included as part of conservatory studies, even though this claim is almost certainly true of other genres of Chinese music it is difficult to evaluate with regard to the qin. Conservatory training has sacrificed regional differences in favor of a new national style, again strongly influenced by 19th century Western aesthetic as epitomized by the Chinese orchestra. The fact that the qin player was typically a literatus who would have been exposed to a variety of regional styles reinforces the perception that differences in qin idioms were never as clear as they were in other genres. In addition, the actual differences between historical qin schools have never been clearly delineated. Such factors make it difficult to say that the conservatories have been influential on this issue with relation to the qin, though the apparent attempts to develop a national syllabus for qin instruction may change this evaluation. Conservatories tend to ignore the original instruments once new "improved" versions have been developed. New techniques are devised for the revised instruments, with little effort to see the unique value of the old techniques. This was also generally true in the West prior to the 20th century, but modern attitudes find unique beauty in the old ways as well. In China (as elsewhere) the musicians employed by the conservatories, since they have their training on the new forms of old instruments, may feel threatened by alternative points of view. With regard to the qin, conservatories and other government music institutions worked many years on the development of nylon-metal strings, and now all the conservatory teachers are employed based on their skills in the new styles elicited by the changed instruments. Is it likely that they will see it in their interest to make room for a competing style? Instead they simply tell their students not to use silk strings saying their quality is not good enough, never presenting them with alternative points of view. In such criticisms, "conservatory" refers to the reality of such institutes today, rather than their inherent nature. The world does have, in fact, some conservatories that include departments devoted to historically informed performance. "Self-cultivation" can be the reason for playing any musical instrument. Indeed, this might well be the reason most parents wish their children to study a musical instrument. If a Chinese conservatory were to include such department focussing on historically informed performance perhaps it could also better prepare teachers who would educate students in the specifics of the traditional Chinese attitudes and practices with regard to playing the qin as a form of self-cultivation. In addition to the comments above, the present site mainly discusses qin schools in the Ming dynasty and earlier (search me: "qin school" / "qin schools"). This includes mention of the difficulty in discerning the characteristics of specific schools, as well as some comment under Yushan School on how one might go about trying to reconstruct early stylistic distinctions. The omission of Yushan school is puzzling. Zha Fuxi does mention it in his article, but he does not identify any representative players from modern times or include it in the chart. Also, although the Wikipedia article Qin Schools mentions these and other schools, to me the stylistic differences in modern qin play seem more individual than due to region or lineage. See further detail under Wuxue Shanfang Qinpu. When I wrote the above there were about half a dozen of the melodies I had learned from my teacher that I no longer played. This is because I was focused largely on melodies published before 1550. Later, when I began working on melodies as published up through the end of the Ming dynasty I was able to add the earliest known version of several more of the pieces I had learned from my teacher. These are the five melodies in this list that have their publication date identified as between 1559 and 1664, plus one ostensibly dated from 1799.